Have you ever felt God lead you to reflect on something? I’m more of a let’s keep things moving kinda gal, but when God shows me something, I long for the revelation. It means being still and quiet and allowing His Word and the Holy Spirit to speak to me. My husband and I just finished a time of prayer and fasting. It was powerful for me. I tried to truly hear what God was speaking to me. He brought my attention to His goodness. I used to think that the word goodness is such a general word that doesn’t have a heavy meaning. Goodness meaning anything not bad. But it’s really so much more than that. It’s the opposite of evilness. The very summit of grace and mercy. I spent some time looking back over the last 5 years. There were some really hard times. God, in His goodness, brought me through each one. Lessons of faith and trust. Being a minor (heh) control freak, trusting in what I couldn’t even see was and is one of the most difficult things that I am called to do. 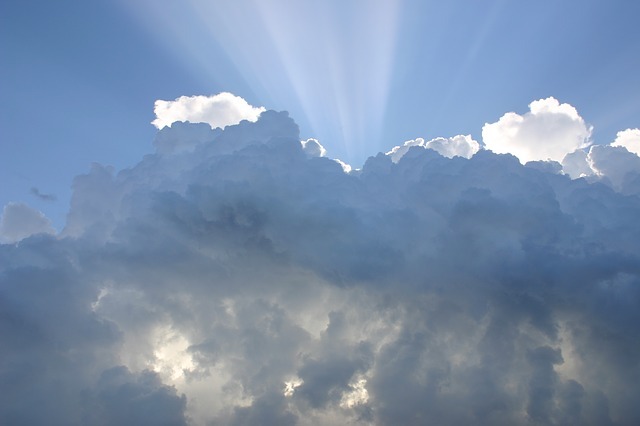 There were many moments of wondering where God was within my circumstance. The pain, the tears, the anger. It was easy to find those things, but harder to find the good. But as I look back now, all I can see is good. When my husband confessed deception in our marriage, there was repentance and forgiveness. Goodness. When I questioned my worth and wished that I didn’t exist, there was affirmation and love poured over me. Goodness. When I was so deep into an eating disorder that my body almost couldn’t function, there was conviction of sin. Goodness. When I was consumed with a lack of relationship with my father, there was a reminder of my eternal relationship with my heavenly Father. Goodness. This list could go on. The Bible says in Romans 8:28 that in all things, God works for the good of those who love Him. And for His goodness, I can’t help but love Him more. It doesn’t make sense. I can’t understand it. The only thing that I do know is that He freely gives it when I don’t deserve it. And for that, I will praise Him. What Can You Do in Five Minutes? The following is a post written by my husband, Max. Sunday November 2, 2014 is the International Day of Prayer for the Persecuted Church. This topic may feel distant to many of us Western Christians. In 2013, I first got an understanding of what Christian persecution was when I read the book Tortured for Christ authored by Richard Wurmbrand, the founder of Voice of the Martyrs Ministry. If you are interested in receiving a complimentary copy of this book, you can get more information here. Richard Wurmbrand showed radical obedience to the Gospel in Romania despite the horrific persecution and torture that he both experienced and witnessed while spending more than ten years in prison. His life is a beautiful testimony of the Gospel and what it means to love. Why are Christians facing persecution? Spiritual warfare is active and real – and it is warring against Jesus’ Great Commission. We must remember this is a spiritual war and continue to love all, including those who persecute Christians. Don’t put your head in the sand. Stand up with your brothers and sisters in Christ that are being persecuted and losing their lives for the Gospel. We can serve them through words of encouragement, prayer, time, and financial support. Join with brothers and sisters in Christ to pray for persecuted Christians, and more urgently, for their mission, the spread of the Gospel. If you need help getting started, I encourage you to start by earnestly and reverently praying. As the introductory video “What can you do in 5 minutes?” shows, a start could be as simple as praying for the persecuted church for 5 minutes once a week. Let us join together in prayer on Sunday, November 2, 2014 and continue thereafter. 1. It’s not about looks. You are not defined by wearing all of the hottest trends, having the cutest hairstyle, or sporting the latest popular shoes. You are not defined by your outer self. God wants you to shine from the inside by sharing your heart! God says it’s what’s on the inside that counts. People will try to tell you that it’s important to stand out by making yourself unique, when they are only making themselves more like each other. A gentle and quiet spirit speaks volumes over striving for acceptable outward appearances any day. Your body is simply a vessel carrying the more important spirit inside. The world focuses on appearance; hair, make-up, clothes, skin tone, the entire body. They will nit-pick it to the very core. And yet, God looks past those things and straight to your heart. He knows who you really are despite what others may think. And even despite what you may think even about yourself. Your value is completely unrelated to appearance. Period. After accepting Jesus Christ, your body is where the Holy Spirit lives. He wants you to take good care of His temple. This means eating healthy, getting proper exercise and rest, and abstaining from physical sin. Our bodies are already God’s, but offering them fully over to Him as a sacrifice is the ultimate worship to our Creator. 3. It’s made just like God’s. You weren’t made to be just like Selena Gomez or Madonna. You were made in the very image of our amazing Creator. You are so important that God made you with Himself in mind. That’s a pretty awesome blessing! He gave you similar characteristics and the ability to reflect His greatness. You aren’t called to absorb the world’s influences and then reflect that. Your body is a vessel for showing the world God’s character. 4. It’s perfect the way it is. You were made so perfectly precise the way you are. He put more thought than you can ever imagine into every detail of your body. He knows exactly how many hairs are on your head. Praise God for making you so uniquely you! Comparison can be a terrible thing when it comes to accepting yourself. The images on TV, in magazines, and all over the internet are nothing but visual representations of physical appearance. They try to set a standard for you that this world wants you to live by. Do NOT fall for this false idea of who you need to be. God made you exactly how He wanted you to be. There is no need to try to be anyone else. You will always be beautiful to God. He knows and loves you more than anyone else. After all, he DIED for YOU! 5. God cares about your body. We’ve recognized that the most important part of our being is what is inside, yet we are also called to take good physical care of our bodies. Not because of looks, but because we have to be healthy to carry out the work on earth that God has called us to. It’s obvious that physical fitness is of some importance to God to be mentioned in the scriptures. He wants us to keep our body healthy both physically and spiritually. Our bodies belong to God and they were made for a purpose: to worship Him. And I finally I want to pray this prayer from Ephesians over my girls so that they understand God’s love and how powerful that it truly is. Pray this over your daughters too! The following is a guest post written by my dear friend, Amy Ford. Have you ever found yourself doing nothing you always thought you would do? You know, that list you made in your freshman year of college with all the things you’d accomplish by twenty-five, by thirty: the charming husband, the master’s degree, the Mediterranean cruise, the book, the baby, the office, the perfect dress size? Have you ever looked at that list which so succinctly quantified success in your eyes and felt like a deflated balloon? Have you ever found yourself doing everything you never thought you would do? Whoever first vocalized the adage, “The surest way to make God laugh is to tell Him what you’re going to do (or what you’re not going to do),” was, quite possibly, the wisest person ever. Okay, I do like to exaggerate, but grant me some poetic license. This proverb, dear readers, is the story of my adult life. And there are days, honestly, when I look at my life and wonder what my role is and what I am supposed to be doing. Am I doing everything the Lord wants? How do I advance the Kingdom when life and motherhood leave me in survival mode? Behind the endless cracker crumbs and diaper changes and recitations of Pat the Bunny, did I lose the person I thought I was? In the swirl, I do not feel chosen, nor royal, holy, or even special. But I do know that I have been called out of darkness into wonderful light, and for that, I have a purpose: to declare the praises of him who called me. In a worship meeting, as this verse marched through my mind, I remembered the priests of my childhood Catholic church walking down the aisle, like a bride, carrying a silver pot of incense, swinging from a chain. The fragrance permeated the sanctuary. Even if you could not see the priest, you could smell the incense. We are a priesthood, you and I. 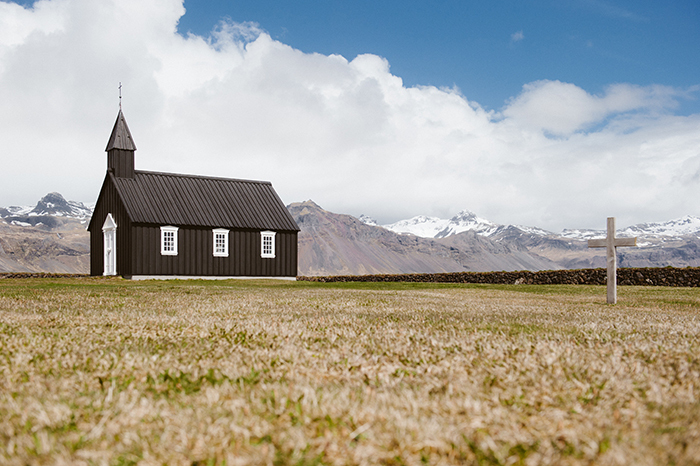 Not just your pastor or your husband – you. And if we claim no other calling, we must embrace this one. A priest tends the flame. A priest keeps the fragrance burning. A priest welcomes the presence of the Lord. In fact, he (or she) never leaves His presence. In my upside-down place of wondering where I fit in, what I should be doing, I, we, must find our place as priests first. My children should see me tending the fire on the altar of praise between the simple walls of my home. My neighbors should sense the sweet perfume as they pass us walking the dog. In my church, in my community, across oceans, and wherever God calls me, I find rest for my soul in my job as priest, and I pray the incense of my life permeates the places I tread, drawing others to Him. I find that the fragments of identity and purpose fall into place when I focus on a life of praise. I pray that we all embrace this, our calling. If we can do nothing else for God, this is our sufficient destiny! We are chosen ones, holy ones, keepers of the flame and carriers of the Divine presence. We are lifters of praises. Amy is a writer, Christ-follower, wife, mother, and recovering middle school English teacher. She lives just south of her native Nashville with her husband of eleven years and her two gorgeous and brilliant children (she also wrote this profile herself, in case you couldn’t tell). Amy has a passion for youth ministry, the arts, and teaching. She looks for the good, noble, lovely, and true in everything — for that is where God’s imprint is found. Read more from Amy at her personal blog, Epiphany. Don’t Miss A Thing: Subscribe To Our Email! If you are like me and tend to miss important posts online, then you may want to sign up for the Gathering Grain newsletter! It’s a simple email that goes out each day compiling all the posts from the day. It’s all in one place! Just pop in your email address below to be added to the list. Don’t worry, I won’t spam you or sell your information! Subscribe to Gathering Grain via Email! I’m trying to be more organized these days when it comes to my home. We moved recently and things were quite a mess when it was time to transfer them from one home to another. Hey, we’re learning right? So this time around, I’m pretty serious about trying organize a little better. I am NOT Miss Organization. In fact, if you find something organized in my home it’s usually out of desperation or force. There, I’ve admitted it now we can move on. 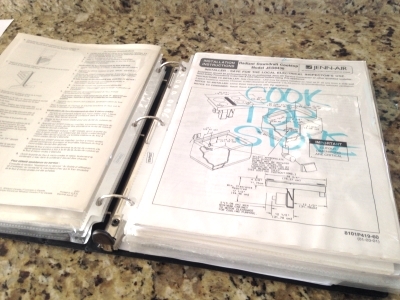 That is why I was absolutely ecstatic when we arrived at our new home and the previous owner had put together this fantastically organized binder. I knew that I had to share it with you! I can’t take credit, but I can use the idea to bless others since it has blessed me so much. Warranties are VERY important. As are the manuals that accompany products that you may have to troubleshoot or just learn how to use. 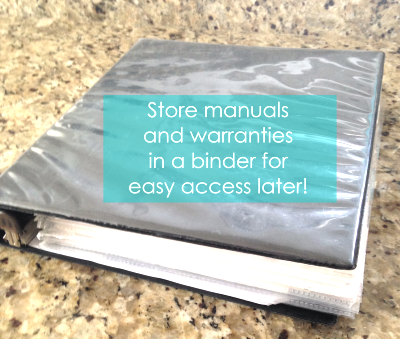 Grab a sturdy binder at the store along with some page protectors and put every bit of knowledge about these items inside it that you can. Saving your warranties is SAVING YOU MONEY! If your product, appliance, etc. stops working, it could be under warranty which means the manufacturer will foot the cost of the fix and not you. Save your manuals and documentation! Directions! Who likes to actually use directions? Most definitely not men. Sometimes they actually do come in handy. Maybe after you’ve tried it the first time and it didn’t work. Use it to learn about your product. How it works. When it needs cleaning. Information about batteries, bulbs, or other parts necessary for the product. Troubleshoot problems. Often times there are codes or red flags that manuals include simply for the consumer to be aware of! I’m so thankful for this binder y’all. The appliances here are a lot newer than we are used to. There are beeps and codes being thrown almost everyday and I’ve had to reference these many times. Eye opener for home organization and stewarding the organization in our home for sure! Have you lost your manual? You can download a manual for over 700,000 products at Manuals Online! WELCOME to Gathering Grain! I’m so glad that you have found your way here. 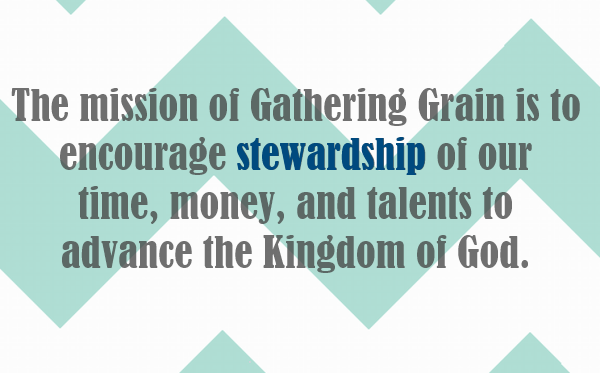 If you’ve followed any of my other blogs before then you’re probably wondering what this gathering grain concept is. So I thought it would be fitting to just explain it to ya in my first post. The verse above is honestly my biggest inspiration for this blog. I love the story of Joseph from the Bible because I can relate to him and some of his struggles. He showed amazing examples of forgiveness, humility, leadership, and stewardship. As a stay at home mom, stewardship sometimes isn’t easy. But it is something that I want to always be improving on. Stewardship- responsible management of our God-given resources of time, talent, and treasure. This blog is not about how I am a perfect steward of the resources given to me by God. It’s not about how you are the perfect steward either. 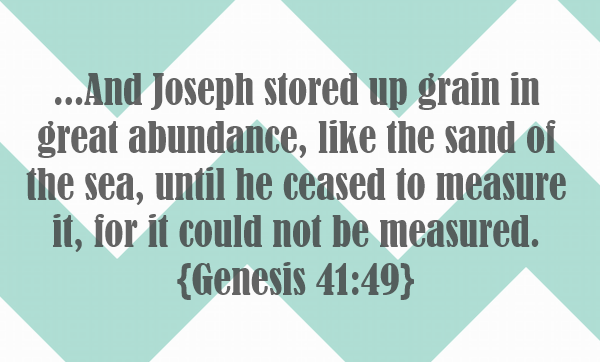 It’s about gathering the grain given to us in abundance. 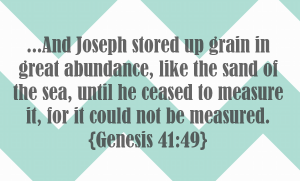 Grain is our money, our household, our relationships, our children, and all the blessings that we gather.